By April Hunt on Wednesday, December 24th, 2014 at 12:00 a.m. Politicians are as known for their noncommittal relationship with the truth as PolitiFact Georgia is for drawing ire from all corners of the political realm. But if you have found *something* to agree with on the Truth-O-Meter, it won’t surprise you that some statements from politicos and power brokers are right, with a little clarification. We ruled those claims from from Georgia leaders Mostly True 29 times last year. Below is a sampling of some of our favorite times when folks got things almost, nearly right. We welcome comments on all of our rulings on our Facebook page, www.facebook.com/politifact.georgia. You can also comment or suggest fact checks to us on Twitter (http://twitter.com/politifactga) or @politifactga. Former Gov. Zell Miller: Gov. 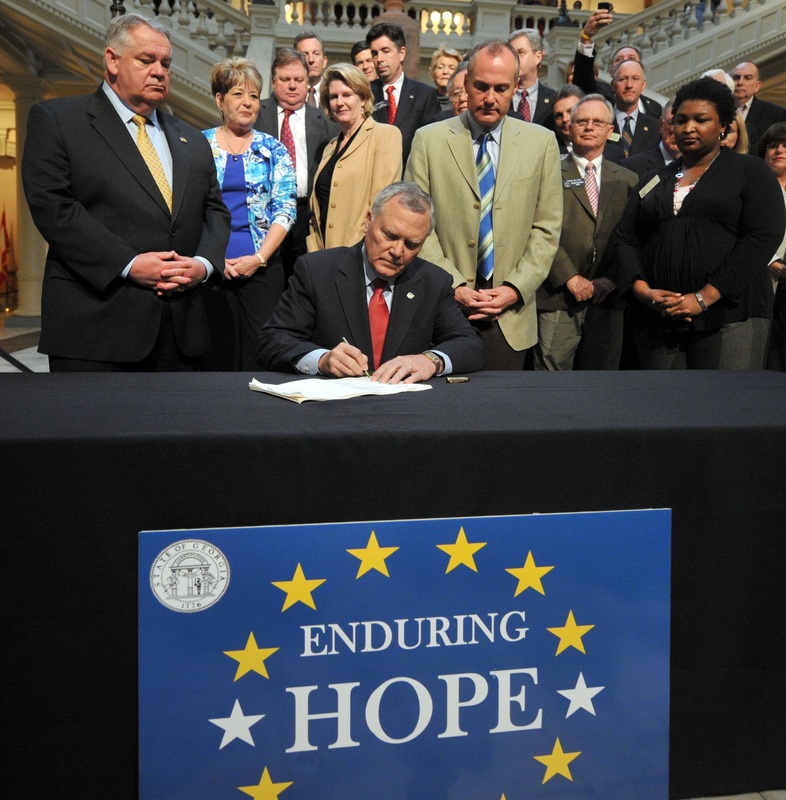 Nathan Deal saved the HOPE scholarship program. The gubernatorial match-up between Republican incumbent Nathan Deal and Democrat Jason Carter focused early and repeatedly on education. In the campaign’s waning days of October, former Democratic Gov. Zell Miller endorsed Deal and gave him credit for saving the popular HOPE scholarship program that Miller started. Reserves were nearly depleted for the lottery-funded scholarship – which paid all tuition costs for high-performing students – when Deal took office in 2011. Without changes, some of scholarship and pre-k program would not be met. Deal worked with lawmakers of both parties to ease the financial pressure, most notably by reserving the full-college scholarships for valedictorians, salutatorians, and those with a high combined GPA and SAT score. The revamp means only about 10 percent of recipients now receive 100 percent tuition coverage. But the effort did keep the program alive to make higher education more affordable for many students. That extra context, about what the changes mean, was important. But Miller makes a valid point that Deal, with the help of lawmakers, saved HOPE. Atlanta Mayor Kasim Reed: Says he kept every promise he made as a candidate. Nothing gets a politician run through the Truth-O-Meter faster than an absolute. "He’s kept every promise he made as a candidate, including re-opening the city’s recreation centers, reforming the city’s pension plan, standing up a force of 2,000 police officers and not raising property taxes." In fact, it was no small feat that Reed kept those specific pledges by doing things such as pushing a pension overhaul through the City Council that helped the city pay off a $1.5 billion liability and save taxpayers $25 million a year and actually lower the tax rate from $10.24 for every $1,000 of assessed value to $9.75. Moreover, we found Reed also kept smaller promises made in campaign materials and at community meetings. Among them: reducing how much the city spends on information technology services by more than $2 million and beginning renovations to the city’s oldest fire station so it could reopen Station 7 in West End. The only catch: Reed’s office was unable to provide a full list of campaign promises. That left a window for promises we may not know Reed made when he ran for office. Yet what we could find appeared at least in process, if not complete, so he earned a Mostly True. Republican U.S. Senate candidate David Perdue: Jack Kingston "requested more earmarks than any other GA Congressman and all GA GOP members combined." The U.S. Senate seat left open with the retirement of Saxby Chambliss created a long campaign season for Republicans. Seven candidates vied for the nomination in the May primary before U.S. Rep. Jack Kingston, R-Savannah, and former Dollar General CEO David Perdue faced off in a July runoff. As the runoff race heated up, Perdue took to Twitter and put a claim over pictures of pigs feeding at the trough to signal his contempt: Kingston, he said, "requested more earmarks than any other GA Congressman and more than all GA GOP members combined." Earmarks are officially the money that lawmakers designate to projects or programs in their districts. Perdue was hinting at the pejorative "pork" with his statement, casting the projects as wasteful spending that drive up federal debt. Under either definition, two databases back up his claim. One showed that Kingston made 145 requests for earmarks in three years, pulling in about $211 million. Together, Georgia's GOP delegation had about $327 million in earmarks in that same period. The other counted 146 earmarks from Kingston, totaling about $213 million. That compares with $116 million in earmarks from the other six GOP congressmen. Missing from those figures, though, is the fact that Kingston represented five of Georgia's eight military installations. Much of the funding was for defense or military spending, such as an IED simulator at Fort Stewart and hospital renovations at installations statewide. That bumped the accuracy of the claim down a notch, to Mostly True. State Rep. Alisha Thomas Morgan, D-Austell: In order to pass the CRCT in Georgia, you simply have to get half of the answers correct. State Rep. Alisha Thomas Morgan was running for state schools superintendent when she gave a speech opposing a study committee to look into the Common Core education policy. In her opposition, she referenced a low threshold for Georgia students to pass the Criterion-Referenced Competency Test in grades 3 through 8 and be promoted to the next grade. "In order to pass the CRCT in Georgia, you simply have to get half of the answers correct," Morgan said. She was referring to cut scores, which vary from subject area and grade level. Students who get only about one-half of the answers right meet state standards. They must get at least 75 percent to 80 percent correct to exceed state standards. The Georgia Department of Education sent us cut scores for 2012 and 2013. The 2012 cut scores were 50 percent or less in 17 of the 30 content areas. The highest cut score was for fourth-grade math, at 58 percent. In 2013, the cut scores were 50 percent or less in 18 of the 30 content areas. The highest cut score was for third- and fourth-grade math, at 57 percent. In other words, in slightly more than half of the subjects for grades 3 through 8, Morgan is correct. We rated her statement Mostly True.